Guddan teaches Rocky a hard lesson. How will Durga react to her brother being beaten up by Guddan? 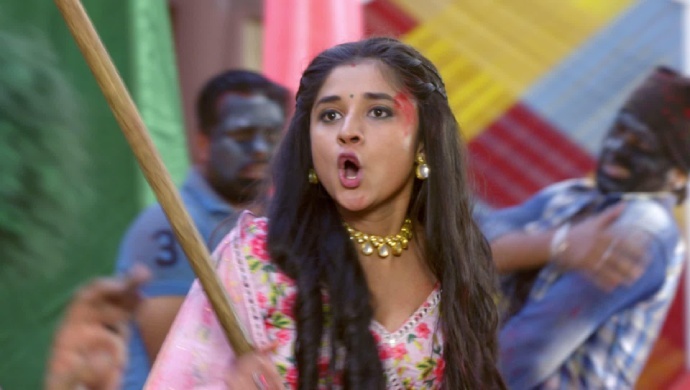 In last week’s episode of Guddan Tumse Na Ho Payega, Guddan tries to get Aj to play Holi with her and not be so angry at her. She takes the help of Angad to play pranks on AJ. Meanwhile, Rocky is plotting revenge on Guddan during the Holi celebrations. In tonight’s episode, one of Rocky’s men takes Guddan along to meet Angad but only to fall in the trap set by Rocky. They start throwing colors and water balloons at Guddan from all angles. Rocky then moves forward to touch Guddan, but Guddan runs and grabs hold of a stick and begins beating up Rocky and his friends. Seeing this, Lakhsmi Bahu also joins her and together they beat up Rocky and his gang with sticks. Saraswati gets a call from her brother Parv, asking her to come up with a plan to get Revathi to celebrate Holi with him. Saraswati says she has enough on her mind already and asks him to help himself. Revathi’s mother comes in telling Parv that Revathi won’t come to him anymore. Parv threatens to kill the mother if Revathi doesn’t go to meet him. Seeing Rocky fail in all his plans, Saraswati goes ahead to instigate Durga to take Rocky’s revenge on Guddan. Durga decides to use Angad against Guddan. She tells Angad that Guddan is not playing Holi with colours because Angad is scared of colours. Feeling sad Angad takes the colours from Durga and faces his fears to use colours on Guddan. Durga is gently manipulating Angad to come in between AJ and Guddan’s relationship. This way she will show Guddan how much she has failed in her marriage to AJ. Will she succeed in her plan? Stay tuned to find out.